Siem Reap is the highlight of many travellers visit to Cambodia. While the UNESCO World Heritage listed Angkor Wat and surrounding temples are a “Must-See” destination, the city itself also has an incredible atmosphere. By day the markets are buzzing and by night the streets come alive with music, great food and plenty of intoxicating nightlife. Damnak Riverside is wonderfully located a mere 1 minute walk to Damnak Temple, 3 minutes walk to the nearest handicraft market and only 5 minutes to Pub Street! The location of this budget friendly hotel truly is ideal. Damnak Riverside provides quality accommodation for travellers who want good value for money without sacrificing any of life’s little luxuries. 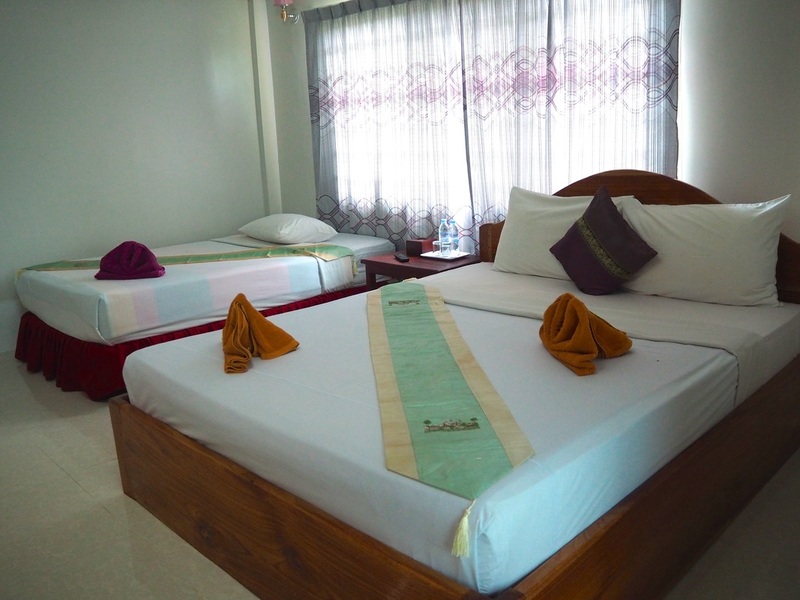 The hotel offers Standard, Superior and Deluxe rooms that can accommodate up to three adults. While the standard rooms are a fantastic option for those on a budget, the deluxe rooms on the top floor are spacious and come with a lovely view from the window and sitting area in the room. We stayed in a standard double room that comes with air conditioning, satellite TV and complimentary toiletries in the private bathroom. The room was clean, the bed comfortable and the in-room Wi-Fi was consistent and reliable. The outdoor pool is surrounded by sun beds, a small bar area and a great restaurant serving breakfast, lunch and dinner, all for reasonable prices. 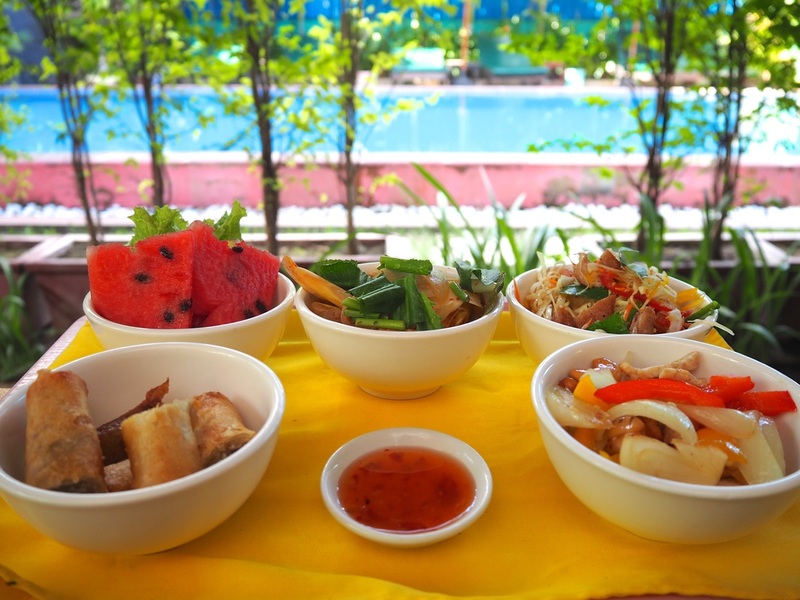 During our stay, we tried the Khmer Sample Platter for 2 people and it was absolutely delicious! Some rooms also come with complimentary breakfast however this depends on individual bookings. 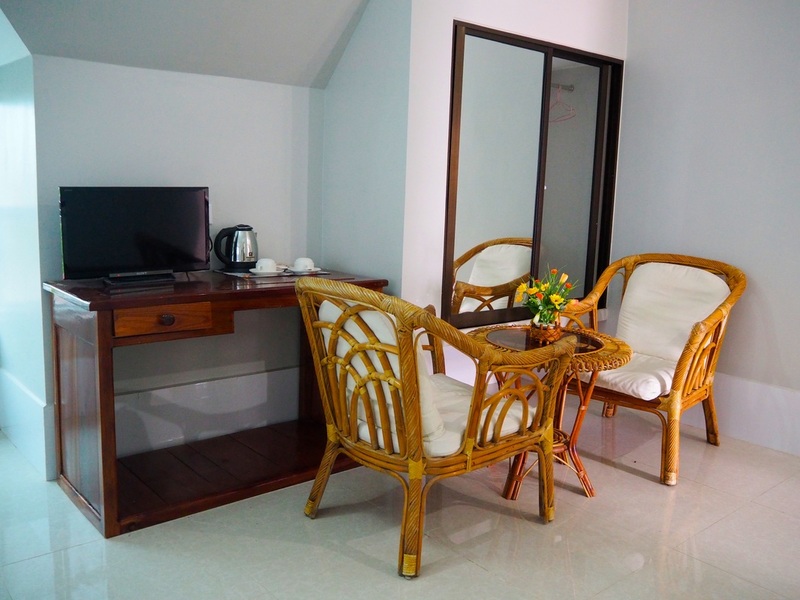 The hotel also offers a laundry service and tourist information desk that offers everything from Tuk Tuk tours of Angkor Wat to booking onward travel tickets to your next destination. The staff at Damnak Riverside were attentive to their guests needs and a pleasure to deal with throughout our stay.